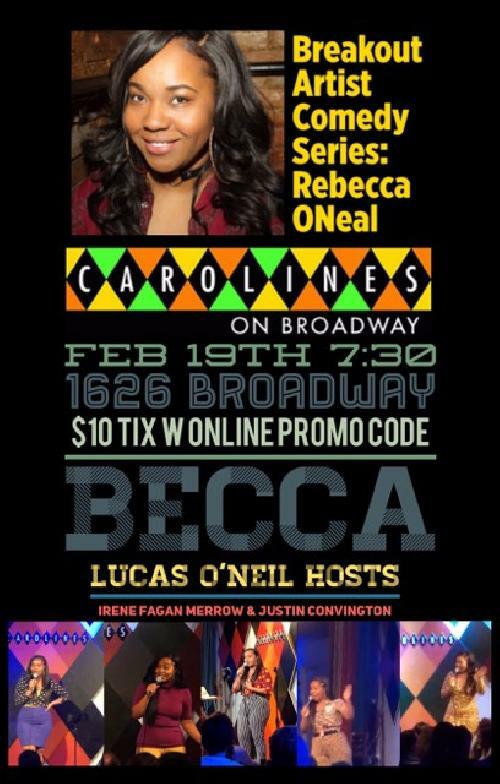 LIMITED FREE TICKETS WITH EMAIL RSVP to rebeccaonealcomedy@gmail.com!!! Rebecca O’Neal is a comedian, writer, and former host of the stand up television show WCIU’s One Night Stand Up in her hometown of Chicago, IL. She now resides in Brooklyn where she was named among TBS’s 2018 Comics To Watch, has performed at Bridgetown, RIOT, Brooklyn Comedy Fest, and New York Comedy festivals, on 2 Dope Queens, written for Vanity Fair, Gawker.tv, Buzzfeed, and Splitsider.com, and has appeared on the season 2 of Netflix’s Easy and on Refinery 29′s After After Party. In Chicago and around the midwest, Rebecca has opened for Maria Bamford, Janeane Garofalo, Arsenio Hall, Hannibal Buress, Michael Che, Roy Wood Jr, Ron Funches, Michelle Wolf, Sasheer Zamata, Jena Friedman, Al Madrigal, Jaboukie Young-White, and more.